New Zealand. The Land of the Long White Cloud. A country filled with literally every kind of landscape and climate you can think of — there are beaches in the north, snow-capped mountains in the south, glaciers descending into temperate rain forests in the west, and volcanoes in the middle. So, needless to say, packing for a trip to New Zealand takes a bit of planning. Pack layers — warmer than you think you'll need, because the weather can change in an instant. Bring something waterproof — again, that weather is unpredictable. Good shoes are a must, especially if you plan to do any hiking — hiking in flip-flops is NOT going to cut it here. Here's a look at my New Zealand packing list, which I've used for a trip in November (which is late springtime there) and a trip in March (which is late summer going into autumn). This list can be tweaked for any time of year in New Zealand! In the colder months, you'll definitely want to add a warm coat and hat! My go-to bag these days is my . It's a 60-liter bag with sturdy wheels and removable backpack straps. Knowing what traveling in New Zealand is like (i.e. no subways to climb in and out of, and mostly getting around by bus or car), I decided to leave the backpack straps at home, since I knew I would have no problem rolling my bag everywhere I would be going. I utilized my favorite (GREAT for keeping tops and bottoms organized) and and my (perfect for socks and undies)and packed the following for my 5-week trip. I wore this North Face zip-up constantly! All of this easily fit into my bag with room to spare — I ended up coming home with a bunch of gifts for family and friends (we're talking 5 t-shirts, 6 tea towels, some Manuka honey, and a bunch of magnets) and could still zip the bag up without issue. I got a right before my spring trip to New Zealand, and I ended up wearing it nearly every day while I was there. prAna is known for making yoga clothing, but they make a ton of other great stuff, too, including comfy pieces perfect for travel. Not only did I get lots of compliments on this jacket, but it also kept me dry exactly as promised. I'm not really a huge fan of hiking, but I WAS very happy to have a pair of zip-off pants with me on my spring trip since it got quite warm on a couple days! The pair I took were , which are very lightweight, yet water-resistant. 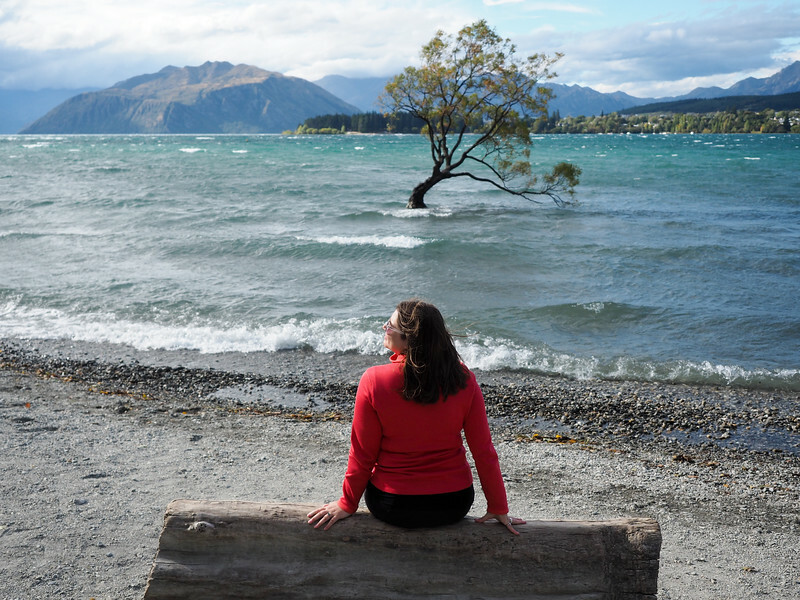 On both my spring and autumn trips to New Zealand, I ran into several days that were colder than I expected. A pair of light gloves and an additional long-sleeved top or sweatshirt wouldn't have been a bad idea to add to my bag! On my spring trip, I only used my twice (since I was mostly staying in hotels and B&Bs where towels were provided), but it takes up hardly any room, so I didn't mind that I packed it anyway. On my autumn trip, I was doing a campervan trip around New Zealand and used my towel every single day. I love these types of towels because they really do dry fast! 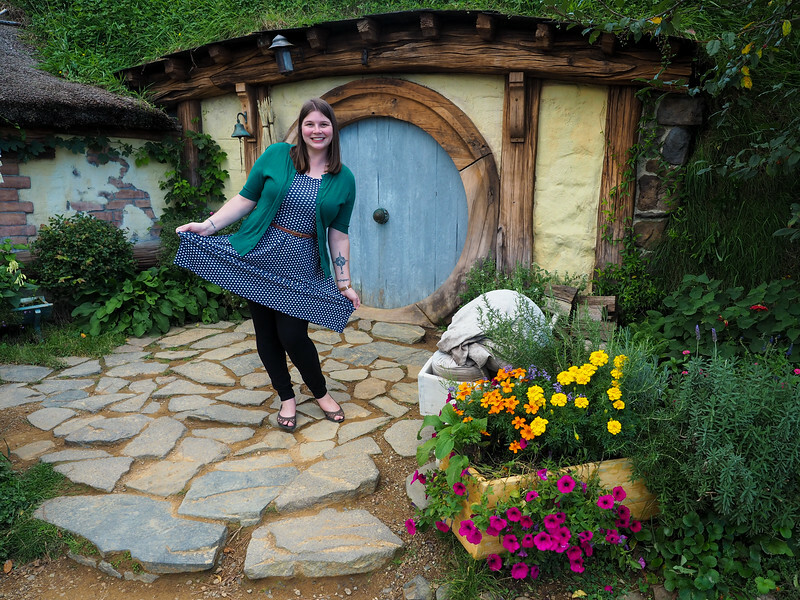 The one time I wore my dress: to fit in at Hobbiton! It's not a tangible item, but I also always recommend packing a good policy! That way everything from lost luggage to a bad accident is covered – because you just never know! I recommend for basic (and really affordable) travel insurance. What if I'm a dude? Good news, fellas! 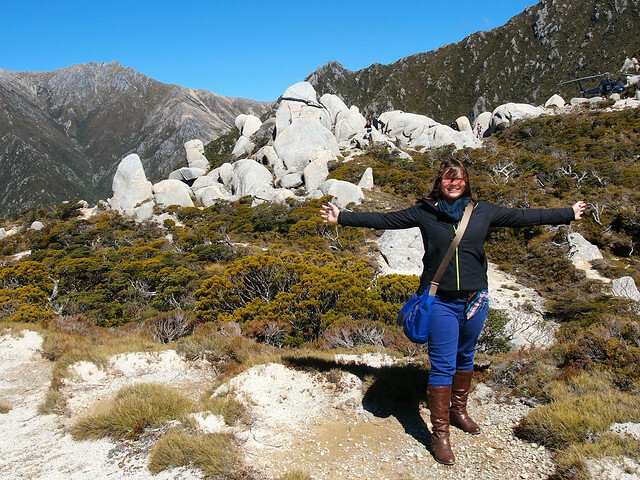 I have some New Zealand packing tips for you, too! Is there anything else YOU would put on your New Zealand packing list? Kiaora.I am very impress with your writings.I am happy to know that you enjoyed your adventure at our land The long white cloud Aotearoa.I live here in Utah for 30 years now and I got home sick sometime when I see or read things like this.Stay safe. I love getting a peak inside other traveler’s bags! It always keeps things in perspective when packing! I’m the same! I love packing lists of all sorts – which is why I share them on my site, too! According to my travel buddy, I once said, “I never go anywhere without a fleece.” Well, when I did, I froze! So next time, yes, bring the fleece! Yeah, it really should just become a staple in my packing lists for cooler-weather climates! There’s something really pervy about getting a lot at other traveler’s bags! Looks like you got it spot on – it’s all about the layers! Hahaha well then call me pervy – because I love reading other peoples’ packing lists! I guess everybody wants to go to New Zealand at least once. I’m in the same situation. I wanted to go there in 2011 when NZ hosted the Rugby World Cup but in the end I missed it. I still plan to go there. Have a great time in NZ! Definitely still worth going! Just go during rugby season and you can still catch some great matches! Slightly overpacking probably won’t kill you – I still have trouble, too! I think you did rather well Akatuki. Perhaps a few too many T-shirts, 3 is plenty LOL, but I loved your zip reversal trouser set-up and the fact that you still took your boots. You go girl! Maybe I do Akatuki. I’m quite nosey LOL! You certainly thought of everything! I love how thorough your post is. You really maximized the space you had with the bags that you brought. I’ll definitely be looking into those on my travels. Appreciate your packing tips. Thanks, Savannah! I’ve had to pack a bag so many times that I’ve definitely gotten pretty good at it! I’m quite impressed at how much are can fit into your backpack. I love keeping it simple when I travel. You did a good job packing. I keep it “simple” in that I tend to pack mostly solid colors and clothing I can mix and match in lots of different ways. 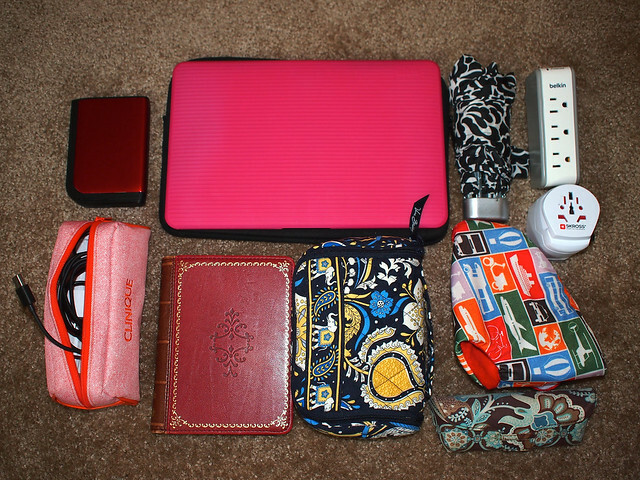 But yeah… I’m often surprised by how much I can fit into my bag, too! Haha. A rain jacket, yes… But even more a wind jacket!!! I stayed there 2 most and had to buy one after 1 week, it was soo windy!!! and good trekking shoes are a must as well! Good point! Wind-proof jackets aren’t a bad idea, either! Very well packed suitcase, Akatuki! I always make my packing list ten days before the traveling day. I try to be practical too and not taking a lot of unnecessary stuff. Can I just say that I love your blog! Your picture at the top is super awesome! I was wondering if you had any advice on how you got your tickets. I’m just looking for the cheapest way possible and I was wondering if you might have any insight. Thanks a ton! I will be continuing to read your blog! Keep it up! Thanks, Malissa! Do you mean tickets to New Zealand? I always keep an eye on flight deals from Air New Zealand – traveling in the shoulder season almost guarantees lower prices. Thanks for the packing list. I’ve just bought padded pants for March April 2016 4 week trip, but not sure I’m going to need them really. We’re doing the Camper Van rather than hotels, so think it could be wise. That as well as shorts, 3/4 pants and convertible ones too. (In place of jeans). As long as you can pack everything, I would say it never hurts to be prepared! The weather can be very different depending on where you are in NZ. Hi! I’ve thoroughly enjoyed your posts about New Zealand! Your love for this beautiful place is clear. I’m going for my first visit in February, and will be visiting the North and South Island. I wondered if you had any advice on combating sandflies. Ugh, sandflies! I’m not sure how effective bug spray is against them. My tip would be long sleeves and long pants that fit a bit loosely so they can’t bite you through the fabric. Thankfully they won’t be an issue everywhere in NZ! Thanks so much for the packing list! 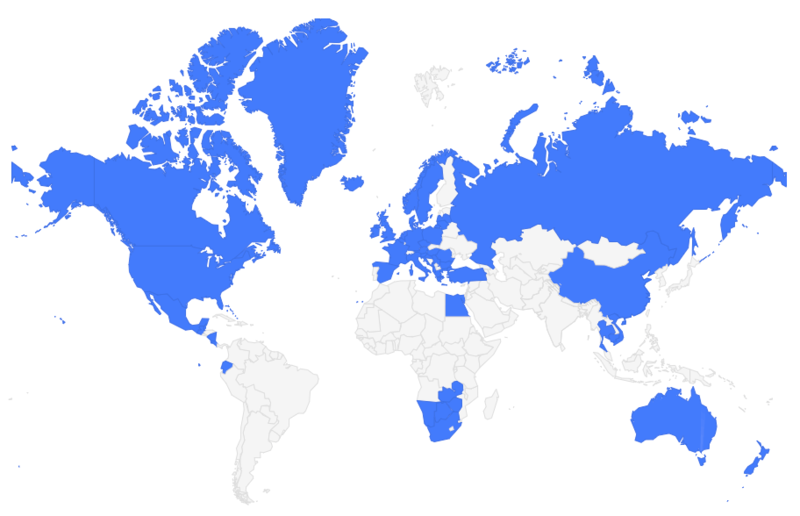 I’m going on Red Carpet’s tour next February, and it’ll be my first overseas trip, so I’m doing a lot of research. One thing I wonder: did you feel like you were over-burdened by having three bags? I’m planning something similar with a suitcase, a small backpack for electronics and stuff, and a purse. Was it too much to carry, or was it okay? Akatuki, have you ever been to New Zealand in the winter months (I was thinking of planning a trip for next August)? With your wealth of NZ knowledge I was wondering whether this would be much too cold a time to go? (I wouldn’t want it to be cold to the point where I was in a winter coat). Yes, I actually lived in Wellington during NZ winter one year! On the North Island is doesn’t really get cold enough to snow, even in the middle of winter. But if you were to go down south (like to Mount Cook or Queenstown) in the winter, there’s a definite possibility that you’d run into snow, especially in some of the higher elevations. I didn’t have a winter coat for my trip, though – just a heavy fleece and a couple of layers! Hi Akatuki I´ve been in NZ like 8 years ago, next august 15 I´ll go again for some adventures and visit some good old friends. I really appreciate your tips, your blog is super. Winter time is awesome there specially for who love snow, Queenstown is like a magic paradise. Hi Akatuki, Thanks for all the great info on your blog! You have inspired me to get back to my photography blog! I have been checking out your New Zealand Posts. I will be there the last week of September with my sister, flying into Queenstown, then over to Moeraki, down to Otago Peninsula, south to Kaka Point, a couple days in the Catlins, then back up to Queenstown. Should we do Milford??? We are birders and like to walk. And I have one specific question about packing, which travel pillow for the plane do you use? As for a travel pillow, I just have a cheap inflatable one that I got on Amazon: I hardly ever sleep on planes, so I’ve never bothered to invest in a better one! I am surprised that you didn’t pack more clothes for warm weather. Normally the end of spring is just as hot as summer in new zealand. Since I was starting up north and ending on the South Island (which is always cooler), I didn’t really need many summer clothes. Between my zip-off pants and 3 dresses, I was fine with what I took for the weather I encountered. Skross travel adapter dual voltage? If I want to recharge stuff using my ZeroLemon recharger, will it blow up if I plug it in without a converter? I don’t see anywhere on these three items saying they are dual voltage to cover both US and NZ. You won’t have any problems with them in NZ (or anywhere else in the world). Nearly all electronics and chargers these days are made to be dual voltage so you can use them anywhere in the world! The Belkin power strip has different prongs for different countries or do you plug it into an adapter? I’m buying a bunch of stuff from your suggestion list so I do appreciate your help! Oh, and from your page so you’ll get credit for it. Good article and good help. My husband and I are planning a last minute trip to NZ in November for 10 days any suggestions on where to go? We fly into Auckland. Do you think we can do both North and South Island in this time? My husbands friend said to spend 4 days in North Island and the rest in South. I’ve read you can easily spend 10 days just in North. 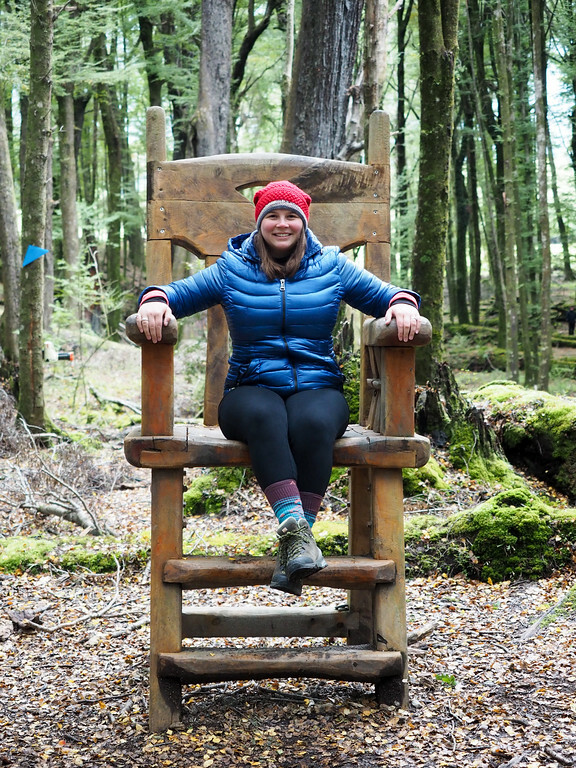 If you head over to the Destinations page on my site you can find everything I’ve written about New Zealand – which is a lot! To be honest, I don’t think you can really do justice to both islands in just 10 days. I would probably pick one or the other, based on what you’re most interested in seeing/doing! Thank you so much for this amazing article and suggestions. We’re going in a few days and I’ve been stressing about what to pack. I’ll make sure to have sunscreen! Happy to be able to help! And yes – be sure to pack sunscreen, and to wear it! The sun is much stronger than you think there. I live in new Zealand. Hope you had an amazing time. Did you hike the tongiriro crossing or do any of the great walks? Anyway if you’re ever visiting wellington flick me a message and I’ll show you some sights all for free of course. I haven’t tackled the Crossing or any of the Great Walks (multi-day hikes aren’t really my thing) yet. But I’m going back to New Zealand next year and am hoping to finally hike the Crossing! Awesome packing list, it’s super helpful! I’m heading to NZ in a week and trying to get things finalized, and your list is a saving grace! what season did you go in? It will be end of spring there for me, so I’m trying to gauge what else I will need. Thanks! 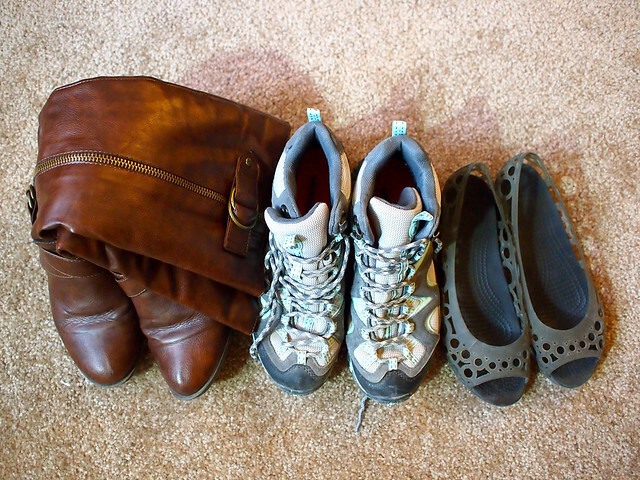 I’ve been there in every season except mid-summer, and this packing list was what I took when I was there in November/December (so spring, but would also be good for autumn!). One slightly random question – I use the same Olympus camera as you (the OMD EM5 II) and remember reading somewhere that you use the 12-40 PRO lens with it. Now, do you think I should upgrade from my teeny pancake lens for this trip? It was my birthday recently so I have the funds to cover most of the heavy price tag! Thanks Akatuki! I currently have the 12-42 pancake lens so it’s a similar focal range, but it suits my needs just fine and the 12-40 is still vastly superior quality wise! I’m also worried about the lack of weather sealing on my current lens which may not do for the glacier heli-hikes and other adventurey things! Oh and btw – I love your photos and was a big contributor in me choosing to buy the Olympus camera in the first place! Thank you for your generosity of information for visiting New Zealand! My family of 4 are taking our first trip there, leaving North Carolina the last week of May 2017, for 3 weeks. That is the beginning of winter, I believe. Any added advice for traveling and packing during early June? I’ve been reading many blogs today, yours has been one of the most helpful, especially the packing list! Yes, early June is the beginning of “winter” in New Zealand, but the season is SO different depending on where you are! This packing list is a good start – layers are always key! It’ll be warmer up north, but getting chilly down south in places like Queenstown by then, so I definitely recommend some layers and a hat and gloves just in case! Very useful. I love reading about what people pack and why……personally I took way too much to NZ. I got the biggest suitcase I could and packed just about everything I could for Summer ( we travelled in December) layers for the chillier days and a rain coat too. Didn’t take hiking boots as we didn’t plan lots of off-roading but did take my Merrell ladies hiking trainers. I wore pretty much the same 6 or so outfits for the whole month, washing and drying at camp sites on our travels. Thanks for this article and happy travels! Hi there! I’m super excited about my trip there in Nov 2018! On the picture, the roll bag seems small. Did it fit all of that stuff in there? Coats, hoodies, etc? Thank you so much for your list, it has helped a lot! Wow, that’s pretty awesome! I don’t suspect ill need to carry it in my back, so the roller version should be fine! I get cold pretty easily, so I will have more long sleeved shirts and hoodies than you did on your list. Did you go with a tour? So excited to go! Thanks again for your list. A carry-on is definitely possible and definitely a great goal for a trip with lots of legs/transfers! You’ll appreciate not having to stress about your luggage. As for airport transfers, most airports in NZ have airport buses that run regularly and are affordable. You can buy tickets once you land, or even on the bus itself. In Queenstown, it’s the Connectabus, and in Auckland it’s the SkyBus. Those are probably your best option for a large group! 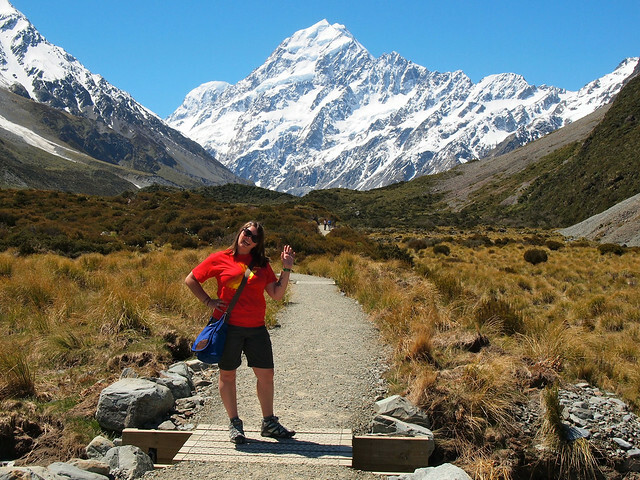 Loved your blog especially the packing list for NZ. Are laundry services available pretty readily. You didn’t take a lot of clothing. No matter the length of trip, I always bring enough underwear for about 2 weeks, and clothing that I can mix/match so that I can usually got nearly two weeks before needing to do laundry. But yes, you can usually find laundry facilities throughout NZ! Planning an NZ trip soon. What is the location where the fellowship hide from the Crebain from Dunland? And how did you get there? Really want to visit that place! It will be autumn in New Zealand then, but it shouldn’t be too cold in Auckland. I would bring a warm layer or jacket in case you hit a cooler, windy day. As for where to go, you could do day trips to places like Waiheke Island, Waitomo for the glow worm caves, or even Rotorua.